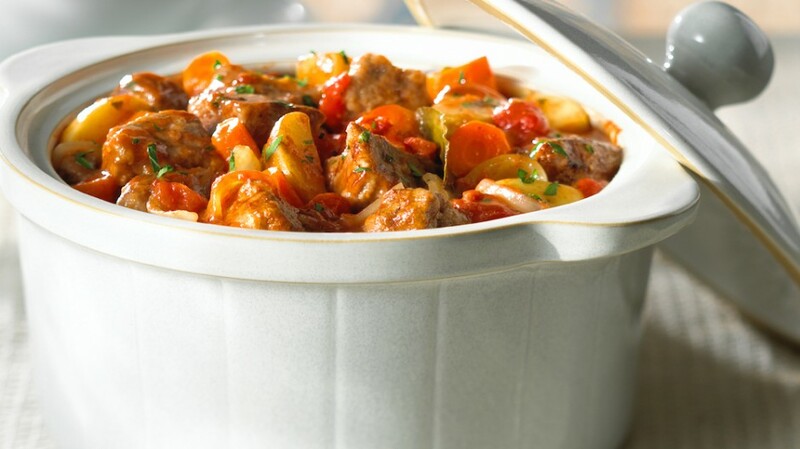 What could be more satisfying than a big bowl of hearty stew? One Traditional Braised Beef Stew recipe makes a big batch so there is plenty for company or you can tuck some in the freezer for later. Heat oil in Dutch oven or stockpot over medium-high heat until sizzling hot. Brown meat in 4 batches. Set beef aside; sprinkle with flour. Add garlic and onion to pot; cook 3 to 4 minutes until just softened, adding more oil if necessary. Stir in broth, scraping up browned bits from the bottom. Add reserved beef, tomatoes, Worcestershire sauce, vinegar, thyme, salt, pepper and bay leaf. Bring to a simmer. Simmer covered, on stove-top or in 325°F oven for 1 hour until beef is fork tender. Add vegetables; cook 30 to 40 minutes or until vegetables are tender. Remove and discard bay leaf. Garnish each serving with some chopped parsley.